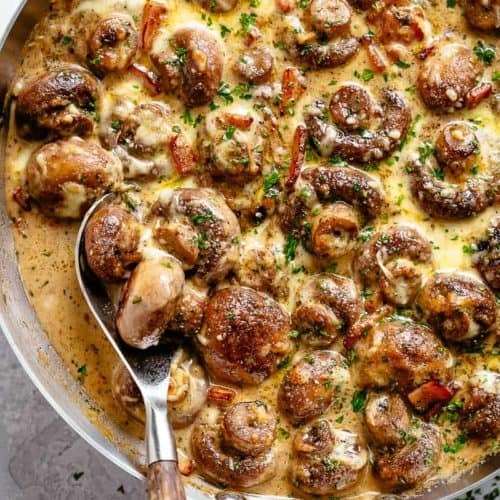 Creamy Garlic Mushrooms and bacon in a mouthwatering Parmesan cheese sauce as a side or main. 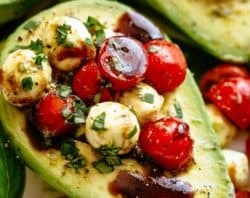 The best Low Carb or Keto Mushroom Recipe! Done in less than 15 minutes, this will become your NEW favourite way to enjoy Sautéed Mushrooms! Filling, hearty and exceptionally delicious, you’ve never had mushrooms like this before. 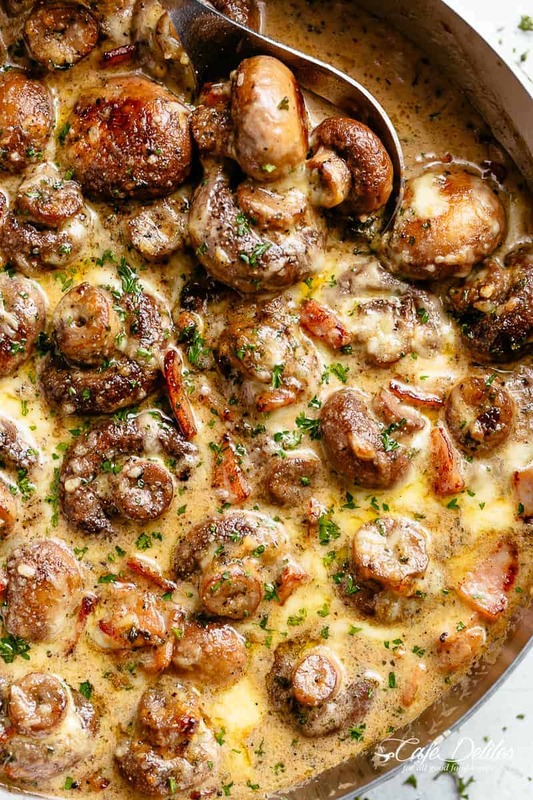 Creamy Garlic Mushrooms with bacon will become your new food addiction. Out of all the mushroom recipes on this blog, this creamy garlic mushrooms recipe is INSANE with flavour. 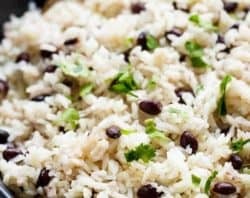 So quick and easy, you can enjoy this recipe as a main for lunch or dinner, or as a side dish. Whatever you decide, you will love this HUGE step up to regular creamy mushrooms. 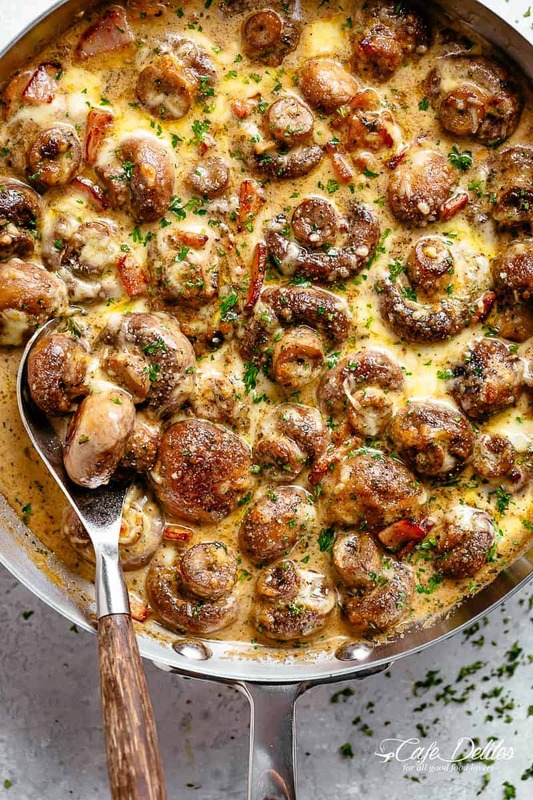 Buttery garlic mushrooms, sautéed in a creamy sauce filled with bacon flavours, herbs and optional white wine. Finished with parmesan and melted mozzarella, and broiled until bubbling and golden completes the flavour explosion. Usually when making creamy mushrooms, you’d only need three or four ingredients. However, we have been asked time and time again about substituting mushrooms in both of these Brussels sprouts and broccoli recipes, now here we are! 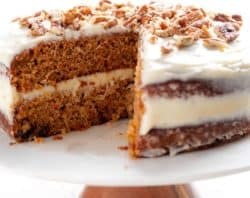 On a side note: Thank you all…because this recipe is crazy good. Melt the butter in some leftover bacon grease. Simmer with heavy cream and herbs. Broil (or grill) until cheese is melted and bubbling. Wipe over each mushroom with a damp paper towel for soft pastry brush if needed to remove loose dirt and debris. Work one at a time. Lightly rinse under cold water and thoroughly pat dry with paper towel. Avoid soaking them as they will absorb water like a sponge and won’t brown during cooking. You want them to brown and crisp nicely before adding the cream sauce. The flavours for this creamy garlic mushrooms starts right there! 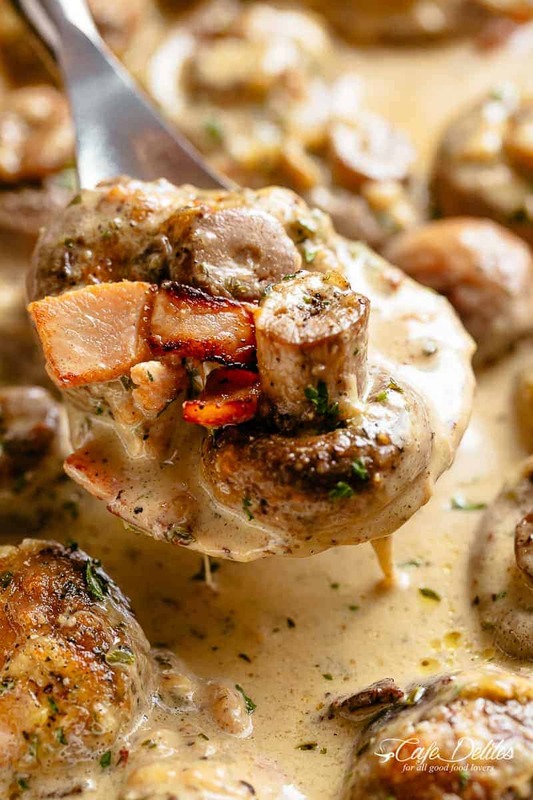 With the bacon in this creamy garlic mushrooms recipe, you really can serve it as a main, on garlic bread or a buttery cauliflower mash to keep it low carb. However, pretty much anything goes… especially for mushroom lovers. 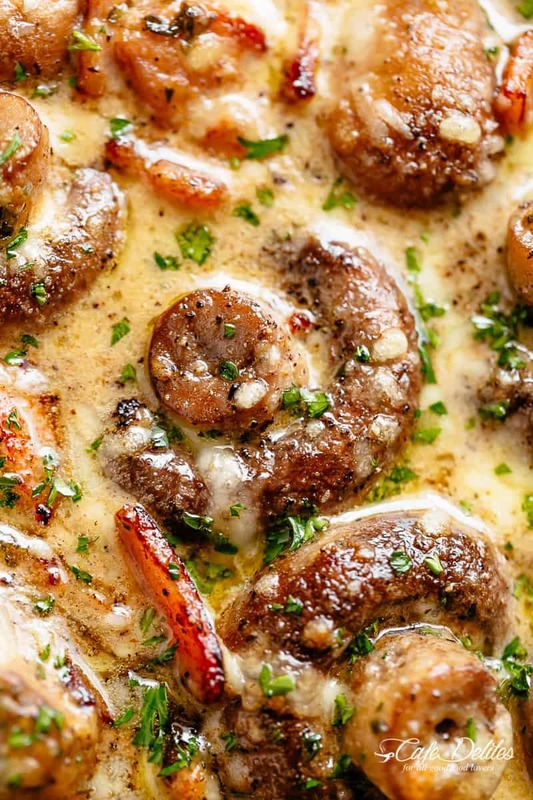 Creamy garlic mushrooms are perfect with steak, salmon or chicken. Or serve them for breakfast! Size: Find mushrooms that are about the same size to ensure even cooking. Type: We use brown (Cremini or Swiss) as pictured here. Choose a type you are familiar with! Rinse and dry them just before cooking to prevent them from getting slimy. In the same pan, melt the butter. Add the mushrooms, drizzle with oil and mix through, scraping up any browned bits from the bottom of the pan. Fry for 2-3 minutes to lightly brown mushrooms and release their juices (if any). Pour in the wine (or broth) and let reduce for 2 minutes, while occasionally stirring. Add in the garlic and stir it through for a minute, until fragrant. Pour in the cream and herbs. Reduce heat down to low. Gently simmer until tender (about 4-5 minutes) and sauce is slightly thickened. Season with salt and pepper. Add the bacon back in and give everything a good mix to combine all of the flavours together. Top the mushrooms with the mozzarella and parmesan cheese. Broil until cheese is melted and bubbly and mushrooms are done to your liking (about 3-5 minutes). Made this last night & wow!!!!!!!!! It was amazingly delicious!!!!!!!!! Holy moly good. Even my boyfriend’s 12 yr old daughter, who normally says “ewwww” when I cook mushrooms, ate some and liked it. Delicious, Just made this!!! 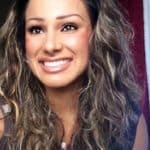 I will make over and over and over again.. This was great! Will take it to Thanksgiving extended family dinner–inlaws. My family LOVED it. 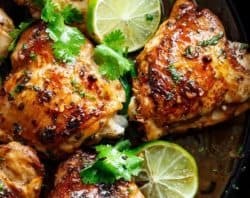 I took a picture–shared it (along with the recipe) with friends and family! Gorgeous dish. Delicious! 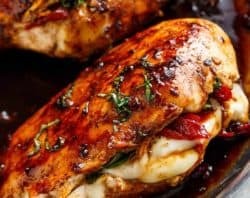 Served over chicken breasts. So good! I added 2 cubed chicken breasts, and served it over noodles. It was amazing! And super easy. This was fantastic – really delicious. I enjoyed every bite, rich as it was. Please dont lol. Fresh mushrooms cooked down are far more tasty than anything out if a can. Always use fresh produce when cooking you’ll never be disappointed. 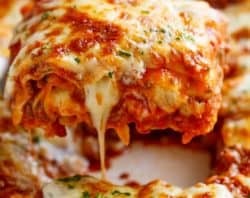 Looks good gonna make this.